Apple’s iPhoto slideshow presentations are nice—if you’re not suffering from Ken Burns effect burnout. Keynote gives you more transitions and provides themes that work well for corporate presentations. But if you’re looking to create slideshows that are more engaging, fun, and eye catching, PulpMotion produces professional multimedia presentations that are anything but ordinary. PulpMotion uses motion themes to add character to slideshows, letting you create a more visually stimulating showcase for your photos and videos. It comes with a bunch of themes, many of which include variations; most are surprisingly useful. You get everything from 3-D transitional effects, museum walkthroughs, and gallery spaces to cinema-style graphic treatments, 3-D animations, and themes for your vacation, holiday, wedding, and other photos. And, of course, the ol’ pan-and-scan standby is in here too. More themes are available from the Aquafadas site. The interface is easy to use and taps directly into iLife for browsing and adding photos, music, and video, though you can also drag and drop media from the Finder. With video, PulpMotion will automatically turn down any music to half volume during the slideshow presentation and hold the next photo frame until your movie finishes playing—very nice. It can even tap into an iSight camera, letting you capture something on the fly to add. The beauty of PulpMotion is the sheer amount of customization and control you have. Along with the usual duration settings, you can tweak the various elements within a theme, edit the motion, switch out graphics, show or hide graphical elements, add text to individual photos or specific themes, choose fonts, adjust type effects, and more. 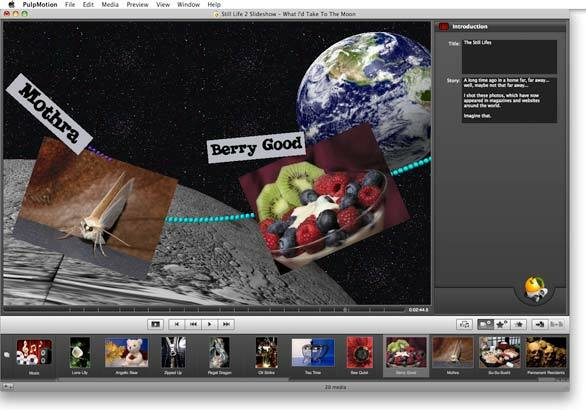 Once you’ve built your slideshow, you can export it as a QuickTime movie for the Web, iPod, desktop playback, broadcast (30 fps NTSC), or JPEG 2000 compressed. While PulpMotion performs well on Leopard and Tiger, there are a few minor bugs (more on the Tiger side) that need to be fixed. That said, PulpMotion is the perfect vehicle for showcasing your photos to the masses. I just hope people walk away remembering my pics more than the cool slideshow thematics that surround them.